This is a story written by my friend and long time fishing partner, Mark Trew. He wrote the story in a hurry, tapping it out on my laptop in less than an hour while we waited for the arrival of another friend to fish the Caney Fork River in 2012. I recently stumbled across the story and though unfinished thought I’d publish it here as a tribute. He always advocated that Localwaters needed to be more editorial with lots of fishing stories and photos, I always said I’d get to it when I could but that the products and website / business had to be completed first to support it financially. Two years later and feeling just about spent / burned out from all the effort on website structure / E-commerce store/ administrative-business / product development and marketing work etc. and I concede: Mark was right. Sometimes the anticipation of a big trip is almost as exciting as the event itself. The “planning” meetings with the other team members help build the suspense, anticipation and optimism…and usually result in a hangover the next morning. The emails fly with gear reviews, packing suggestions and the coordination of our launching and takeout points. Some challenges are suggested with the carrot of collecting $5 from each member of the party for: The first fish of the trip. The biggest fish of the day. The most fish on the float. That kind of thing. Planning meeting for Caney Fork Float Trip over poker and beer on the deck behind Mark Trew’s design studio in Berry Hill. Mark Trew (middle) Ryan Stoney (left) Mark Martin (right) – Photo by Joe Hardwick. I actually won “first fish of the day” once up at the Tellico River, taking a pocket camera photo of my catch next to my watch at exactly 7 am. I was going to need this proof later because several of the party (all of them) had difficulty arising after the previous night’s card game and attendant libations. Luckily, my money ran out early and I went to the bunk ‘bout midnight. About 5 minutes of that rushing water music of the Tellico River right outside and I was out fast. Mark Trew with cigar and pants on fire at the Green Cove Motel a few feet away from the Tellico River. Trout sizzling on the fire the night of the spider bit “Indian Chick” and the smuggled beer that almost woke the elders. Ryan Stoney on left with back to camera. Ryan caught his limit of trout the next morning within 100 feet of our motel room door, though Mark won first fish and a $5 bill. My buddies played on into the wee hours with some Cherokee Indian chick who worked at the camp market and was able to smuggle beer (paid for) out to the boys basically all night. Her constant admonishments of “please don’t disturb the elders” was both comical and authentic. Her massive spider bite freaked us all out. I made sure to shake out my clothes and shoes the next morning…jeez! As our trip to the Caney Fork nears, we are all hopeful that the planets will line up. We’re on the calendar, and all possess a “kitchen pass”. Plus, so far, no pesky clients are trying to alter our scheduled departure with game changing offers of profitable freelance projects. We hold our breath and continue to plan our getaway. I really didn’t believe we would get away until we were out of the county. We were finally actually on the road and loaded for bear! Even before I open my eyes, I know I’m not in Kansas any more. Robins are singing their morning songs and yes…I just heard the first Cicada starting to warm up and try to buzz. I open my eyes and even after rubbing them, things are still a blur. I put on my glasses and find that we are fogged in. Even though the day will get to near 90 degrees, the water is still ice cold. You can’t hold your hand in it for more than 30 seconds! A nice cool breeze freshens from the East and the fog is carried up river like a soft magic carpet, breaking into long thin wisps of cotton candy, then disappearing to reveal the sparkling clear aqua blue-green water of the Caney Fork. With her rolling surface dotted with white Cottonwood seeds, the Caney slides by so clear that you can see the bottom as if there weren’t even any water there. And then the placid scene is rudely interrupted as the Cicada’s warm up enough to start their daily incessant buzzing. The fish have noticed that some of the less talented flyers have touched down in the wrong part of town and are noisily harvesting them as if they hadn’t eaten in days. We gather some of the Cicada’s in a creel for use as bait after breakfast. All this fresh air and paddling have made us hungry too! Here is how he responded early one morning of the float trip that “he’s not in Kansas anymore”… Does this look like a guy that’s “listening to robins singing” and embracing hope at the dawning of the new day? He was a great guy but I could never amend his memory of “who was the first to get up and fish on that trip out West back in 93,” I learned I had to photograph him as proof ten years too late, looking back it was about 50-50. We rustle up a big feed of scrambled eggs and bacon, walking with our plates and folding chairs to the shady side of the river. Sitting quietly, it’s too perfect to talk above a whisper. With our feet in the icy waters and our hot breakfast in our laps, we watch a pair of Osprey’s catch their own breakfast of rainbow trout. When flying with a captured fish, we noticed that they hold the fish head forward and aerodynamically, like a torpedo. They really hit the water with intent. Both ospreys catch fish on the first dive and fly off to enjoy the bounty at their feeding tree. Only the rising fish convince us to relinquish such a grand scene…but the fish were feeding, and we needed to get crackin’. in the feast of plenty. I carefully swing and roll cast my Cicada into the midst of the chaos. The water is so clear that I can see the fish studying my offering from below. A whoop from my buddy upstream tells me I’ve missed the first fish of the day award on this trip. Turns out I missed it by a great deal. The winner’s fish was a 24 inch Brown…we all rejoice and then get right back to working our respective pools. My best catch of the day was a surprise, a big Walleye that made a really incredible Tomato Bisque appetizer at that nights’ campfire dinner, enough for everyone and then some. The main course though was trout amandine, a first while camping for us all. The one big Brown from the morning was gut hooked so we kept him and fed the entire party easily, we must have released a hundred fish that day. Using our own carefully blended seasonings, perfected over the years, we had the best feed of the year. 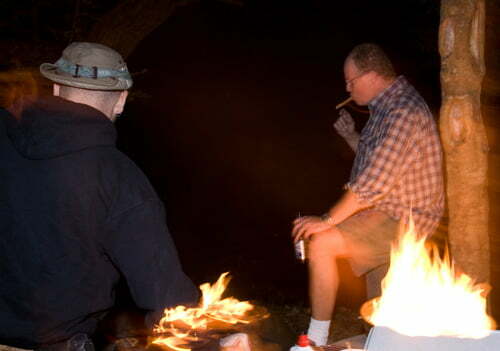 Then it was time for cigars and single malt around the campfire. That night’s card game was full of surprises too…I actually won some of my money back from the night before. Deciding to step away from the game while I was ahead was not really that popular with the guys, but it led to a wonderful vision of nature. The fireflies were all sparkling in the trees up and down the river banks in numbers like I’d never seen before, all while distant lightning played 360 degrees around us. It looked like Christmas at Time’s Square or something. With the sky directly above us so clear and the stars so close…the cards were forgotten as we all stared with our mouths agape at the wonder and beauty around us and all conversation ceased. We were all really “out there” in the wild and it felt just great. The art of nature is ever surprising, and we felt honored to witness such an unusual light show. I took a mental snapshot and decided to try and recreate the image on canvas so I could revisit the moment often. If I try, I can sometimes meditate myself into that moment with the sounds, the sounds and the scents of the river. My buddies just standing there in hushed wonderment with no need for anyone to say “shhhh” we were just stunned as a group. Our next bivouac was at a large curve in the river where Smith Fork Creek enters the Caney and with the deepest pool right at it’s apex. (Sebowisha my buddy calls it) I fished it early before dawn with spinning reel and a very small countdown minnow in order to get my offering down near the purported “big ones”. I was reeling in a decent Rainbow and was just about to slide the net under it when a huge mouth full of teeth came up from the depths with obvious intentions to take my fish. It was a giant Striped Bass, and it snapped it’s tail at me before disappearing back to it’s dark hiding place in the deep pool. As I unhooked the trout I noticed a tail sticking out of it’s mouth and upon closer examination, found it to be a baby Common Watersnake. As I released the unharmed snake and the daredevil trout, it occurred to me that we are lucky to be at the top of the food chain. So far. That night, I decide to save my money and retire early to my hammock to read my current favorite fishing book, Trout Bum. It was very satisfying to me to be reading this seminal fishing book, written by a true outdoorsman, while sitting only a few feet away from the fast moving river. Even the background noise of my buddies’ playing cards seemed apropos. Alas, I only accomplished 5 or 6 pages before I found my head drooping to my chest. I was tired, but it was a really good kind of tired. Crickets and campfires make for great lullaby’s. I slept the sleep of the vanquished. 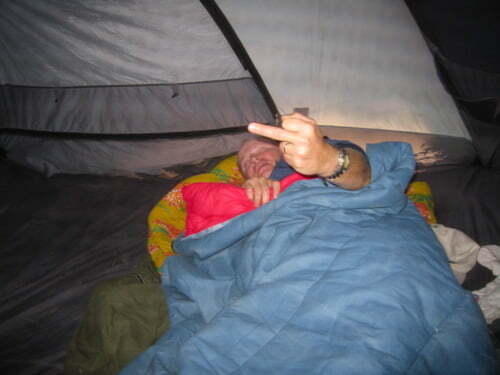 Around dawn I woke to the sound of distant rolling thunder. At first the rain was just enough to make you want to sleep in a bit longer. But then it turned a good bit more impressive with strong winds, fat lightning bolts the size of a house, and thunder that filled the river valley with echoing claps of incredible power. We stayed in our respective tents and hollered encouragement to Thor, the God of Thunder to give it his best hammer and were not disappointed. Just about the time water started to flow under our tents and it was becoming a lot less fun, the storm flowed out of our valley and left us with a light rain we could handle. Doing our best to fix a hearty breakfast for our last morning of the trip we discovered a couple things. 1. You can cook bacon in the rain. It spits like heck when the bigger drops land in the hot grease, but it is possible. 2. Scrambled eggs…not so much. I also discovered that not all raincoats actually shed water, even some expensive brands that are supposed to be specifically designed for fishermen and….well rain! I now performance test all my gear before it qualifies for a 3 day trip. Caney Fork River, canoeing in fog and rain. We waited until the worst of the storm was over but had a long way to go to get to the Cumberland River. This is where Mark learned that his hundred dollar rain coat wasn’t water proof. But I actually enjoy the rain. It is my personal opinion that a “little weather” usually makes a trip more interesting. Luckily, I didn’t have to sit in a canoe soaking wet all day since we were approaching our takeout. The rain let up and a freshly washed sky revealed itself just as we pulled up to the shore. Damn. The takeout was reached quietly and with a good deal of regret. I mean, we were all anxious to return to our respective families and soft warm beds…but the adventure always has to have an ending. This was a great one! No injuries and everyone walked away with great stories and a few fresh fish in our coolers. As we all packed and loaded our canoes and gear into our respective trucks and trunks, it was with both a fresh outlook on the state of our lives, and obvious regret that our big trip had come to an end. In the following days we all shared photos from the trip via E mails and began to plan a short interim trip to Calderwood Lake. Through long experience we’ve found that life in the city is made more tolerable when you always have that next trip to a river marked on your calendar. The memories and the camaraderie will last forever, and I keep the hope alive there will be many more trips to come, but the drive home from the river is always kind of sad and spent in quiet reflection of all that was experienced. I’m thankful that I have “action buddies” that share my creed. They understand my code. It’s great to be part of a “we”…”we did this”, “we did that”. Luckily, since most of my crew are professional photographers we have photographic proof to back up most of our stories. Because friend, sometimes your stories need backing up, in my personal experience, many fisherman lie. Not my friends, you understand. Never. Serious planning for the next big trip needs to start right away to give us something to really look forward to. Maybe the Everglades? The “skinny water” of the Keys or maybe even Matlacha? The wheels start turning in our heads and the anticipation builds. All we need is for the planets to line up again…maybe this Fall? Mark Frank Trew lives, paints and fishes in Lancaster, Tennessee. To view several of his trout fishing works visit his site at: www.artsmith.com. Mark Trew was an artist, here he paints a scene on the Tellico River during a fishing trip there in early Fall 2010. He was a big advocate of En plein air painting and really enjoyed painting fish and fishing scenes. Mark Trew never edited this hurriedly written story or polished it up at all, he never will. Tragically Mark passed away suddenly last Spring (2013) and like this story he left a life unfinished. We did end up making that trip to Matlacha Florida for a week of fishing hard for red fish and speckled trout out of my little Gheenoe skiff between Christmas and New Years 2012. Mark was 6 feet seven inches tall and well over 250 pounds, a nice fish always looked small when he held it for a picture and I would kid him endlessly about stretching the truth about his catches, he began to carry both a camera and a tape measure in his tackle box just for that reason. I’m grateful for a fishing trip we took together on a foggy moon-lit night on the Caney Fork River only a couple of months before his death. It was then that I watched Mark do a masterful job of fighting and bringing to the net a 28″ 8-10 pound brown trout on 6X tippet (3.5 pound test line) while in the dark and standing waist deep in fog and heavy current. It was his personal best brown and I smiled as I handed him back his five dollar bill, the same bill that he’d just given me for my measly 24″ brown a few minutes before. We never weighed his brown, Mark was a life-long preacher of proper quick handling and catch and release. It surprised me to see him mention in his story that we ate a few while camping on the river. Mark Frank Trew, master angler with his personal best Brown Trout Caney Fork River 2012. 28″ Brown Trout caught at night in heavy fog and current on 6x tippet (3.5 pound test line.) The fish was never weighed but was fat and would have gone 8-10 pounds. He was a great Father, a good fisherman and my close friend. He always called me a “results oriented angler” I don’t know why but we did have a friendly competition while fishing. I knew him for thirty years, first as an artist, then a graphic designer and an art director and eventually as creative director. He filled the role as my creative supervisor on many commercial photo shoots for corporate clients. I’ve heard it said many times by many people he had the best “wrist” in the South ( for his marker comps and advertising sketches.) I think of him and his enthusiasm for his two children and life in general every time I fish. I always will. Rest in Peace Mark Trew, you were a true gentleman. Mark Trew catches the first fish on the Matlacha Florida trip and wins $5 with this measly little Speckled Trout. He caught the first fish way too often. Mark Frank Trew Fishing for red fish in shore Florida. Mark Trew in my Gheenoe at Slick Rock Creek North Carolina – Tennessee. Calderwood Lake Trip. He got a kick out of being in Tennessee while fishing in North Carolina without a NC license. Slick Rock Creek is on the state line. Mark Trew and his son Jack with a nice rainbow trout he caught on the Caney Fork River. We were bait fishing for Jack’s sake and Jack’s reel got jammed so Mark brought the fish in with the line hand over hand. It was hooked too deep so they kept it for dinner.